RT correspondent Murad Gazdiev and his crew have come under fire in the area of the Donetsk Airport, which was the scene of intense fighting for months before the ceasefire agreed in Minsk started on February 15. Gazdiev, cameraman Sam Henderson from RT’s News Team show and a contributing cameraman, were filming at Donetsk International airport when it happened. 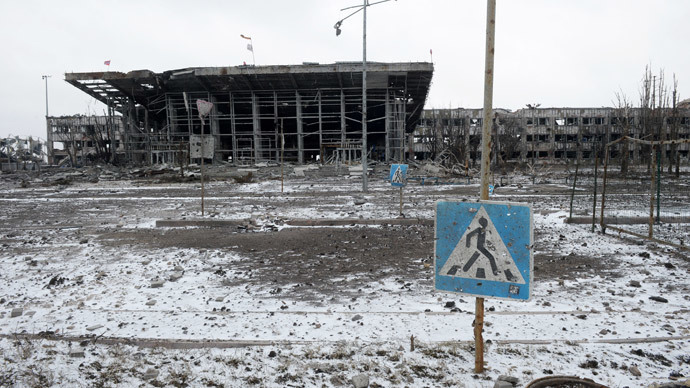 “We went to Donetsk Airport, they said it was relatively safe… with the ceasefire. Compared to what it was a few days ago – an endless series of explosions and bombing and shelling – it was relatively calm,” Gazdiev said. As they stepped onto the runway that serves as an improvised border between the positions of anti-Kiev militia and Ukrainian forces, they heard mortar fire and shells started exploding near them. The explosions followed them as they tried to get to safety. “When we were about halfway through the airport – we were by the hangars – mortar shells started whistling down right next to us, within 50 to 100 meters. There was a lot of cover and we got behind that. There were a dozen, maybe more mortar shells. And they just kept coming down where we were making for,”Gazdiev said. The shelling comes amid a general ceasefire, which came into force on February 15. RT's reporter and cameramen appear to have escaped unharmed. The latest breakthrough in the conflict is the Minsk agreement, which has offered some hope of an end to the fighting. The deal provides for a ceasefire and pullout of heavy weapons as the first steps towards a political settlement of the Ukrainian civil war. It was reached on February 12, following marathon overnight negotiations between Ukraine, France, Germany, and Russia. It was also signed and later ratified by the Ukrainian rebels. The document stipulated a ceasefire starting at 00:00 on February 15. The deal gives hope of peace for the imperiled country, although many skeptics say it will collapse the same way the previous ceasefire faltered in January. In particular, clashes continue around Debaltsevo, a city held by Kiev’s forces and besieged by the Ukrainian anti-government troops. Fighting continues there even as ceasefire is mostly observed in other parts of the conflict zone. The militia forces insist that Debaltsevo has been encircled and that their opponents should lay down their arms and leave it immediately. Kiev claims that the city is its advance stronghold and must remain under its control under the Minsk agreement.